A Russian frigate on its way to the Baltic Sea was escorted through the English Channel by the Royal Navy on Tuesday. The Yaroslav Mudry, a Neustrashimyy-class frigate in the Baltic Fleet, was followed by HMS Argyll, which deployed a Lynx helicopter to track the ship. The press service for the Russian Western Military District, a strategic command of the armed forces, said the frigate will arrive at its permanent base by February 23. A Ministry of Defence (MoD) spokesman said the British Royal Navy took over from French surveillance. 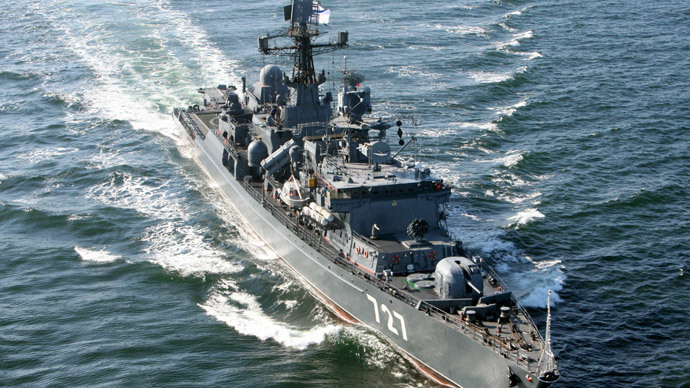 According to RIA Novosti, Yaroslav Mudry left its main naval base in Baltiysk on August 9, 2014. Since then it has traveled 25,000 nautical miles and visited nine countries including Spain, Pakistan, Malaysia and Syria. While in the Mediterranean Sea, the frigate participated in training with other Russian warships as part of a permanent task force established there in April last year. Russia’s other naval presence in the Mediterranean is a supply and maintenance facility at the Syrian port Tartus. Ria Novosti reported a statement by the Russian Western Military District, which indicated the Yaroslav Mudry would return to its base within a week. “Currently, the crew of the neustrashimyy-class frigate has begun the passage of the English Channel. After crossing, the ship will have to pass through the North Sea and the Baltic Straits. It is expected that the ship will arrive at its permanent base by February 23 – Defender of the Fatherland Day,” the military press service reportedly said in a statement. Defender of the Fatherland Day is a national holiday which honors those serving in the Russian Armed Forces. Its origins extend back to 1919, when it was introduced to mark the date in the Russian Civil War when the first mass draft of soldiers into the Soviet Army occurred in St Petersburg and Moscow. A British MoD spokesman said cooperation between French and British military forces in tracking the frigate was conducted as per the NATO agreement. “Under the NATO agreement whereby alliance nations co-operate to monitor activity, the Royal Navy took over from French surveillance,” he said. A Russian warship is escorted through the English Channel every few months, the MoD spokesman added. Russia’s Northern Fleet conducted training exercises in the English Channel near Dover last November, headed by a large anti-submarine ship, the Severomorsk. After training, the squadron anchored in the international waters of the Seine Bay where they waited out a storm. The naval exercises were monitored by the British Royal Navy’s HMS Tyne, an offshore patrol vessel.